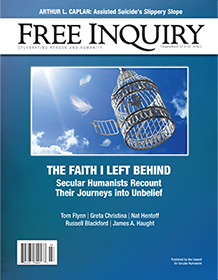 In the April/May 2013 issue, FREE INQUIRY invited readers to submit autobiographical essays describing the life-stance odysseys that had led them to their present positions of secular humanism or atheism. I had a fairly normal childhood. Most weeks I attended Sunday school, sorting through crayon nubs to color pictures of farm animals, children, and disciples all clustered around Jesus with looks of adoration. I was fifteen years old (I am now eighty-nine) when I discarded the myth that there exists somewhere an entity that created the universe and, by the way, also the human species. Since, by derivation, atheism means “without God” and agnosticism “without knowledge (of God),” there is really no difference in meaning between the two terms—so why not choose the one that has the less dogmatic tone? I am no longer a Catholic because it defies reason. And while I feel so very lucky to have escaped, I’m angry that it took me several decades. What changed my mind about Islam? I’d like to think that my mind changed me. Becoming an atheist doesn’t happen overnight. For me, it’s been a lifelong process. At age eighteen, I attended an all-boys Catholic high school wearing a gold cross attached to a necklace. Surely, I could make anything happen just by willing it into existence. Except that it didn’t work that way. I liberated myself from theistic paradigms and found myself immune to emotional appeals to believe in what, I was sure, was never true. Some amazing things about the New Testament often escape notice. Today, adherents of even the wackiest beliefs try to conjure at least a veneer of rational justification and evidential support. This article describes two well-documented historical examples in which the danger of invasive religion was properly perceived and understood, and efforts to stop the invasion were instituted. Let’s look back at The Nine Demands of Liberalism and reflect on the differences between what freethinkers wanted circa 1870 and what many in our movement want today. Too little attention has been paid to a practice that results in actual, destructive interruptions in schooling. Two main ethical concerns are advanced against the legalization of physician-assisted suicide. The number one thing I want to say today is this: social justice issues are atheist stuff. Even if we all fully embraced the ideal of secular government, and even if this nudged us all in the direction of liberty and social pluralism, there would remain much scope for political disagreements. I’ve decided that there is no such thing as sophisticated theology. Too many had a naïve idealism that left them not only susceptible to, but defenseless against, evangelism. In this article, we will explore some hypotheses about the origin and attributes of an entity whose importance to earthlings ranges from contemplation every waking hour to absolutely zero impact. A review of Beyond the God Particle, by Leon Lederman and Christopher Hill.